I just finished the 1st eight episodes of White Tower and was totally into this heavy medical drama. It was at times riviting and at times a bit slow, but overall I am enjoying it! Basically any series that has Kim Myung Min (of Beethoven Virus) and Lee Sun Gyun (of Pasta, My Sweet City, & Coffee Prince) as the leads is a winner for me. I love both of these actors and if you have read my comments on any of the series they are in I have no trouble going on and on about them. 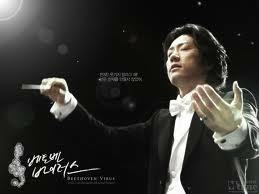 I have only seen Kim Myung Min in Beethoven Virus so I have a lot of respect for him after seeing him in another role and completely embodying it. He was more dynamic in White Tower but just as commanding. Lee Sun Gyun was more muted and this wasn’t my favorite role for him. Even his glorious voice made little impact here. In the first 8 episodes they complete an entire story and left me very satisfied, but just at that moment of comfort they flip the script and make my Dr. Jang the arrogant bad guy. Noooooo, I don’t want him to be the bad guy. Oh you writers, how could you do that and then you want to flip the script again….. argh!!!! Overall, this was a good medical/legal drama; almost no romance, and very little humor but gritty and enthralling. I would give this a solid B. So here is my big complaint though! argh! I hated Dr. Lee’s daughter, I was annoyed by her political activism, basically a spoiled rich girl that wants to fight for the poor. boo hooo, whatever. She pushed that girl into the lawsuit but herself had nothing to lose if they failed, which you know initially they did and it tore up that family. She kept pushing and kept pushing Do Young, Dr. Yeom and Nurse Yoo. The victim should have settled, she would have won a monetary settlement and everyone else would have been spared the emotional distress of the courtroom battle. I know – maybe it isn’t right to feel that way because her husband did die a horrible death and it was completely due to negligence, but oh I wanted to hit her and her stupid hair and tooth. argh! Here’s an adorable clip of KMM with his family, his son is beyond cute!